Diplomacy. The art of telling someone to go to hell in such a way that they look forward to the trip. I thought of this when an email from Waitrose arrived today. I am no great advocate of being rude to customers. Neither am I fan of sugar-coating the truth. Customers aren’t as daft as businesses believe. Which is fortunate, as Waitrose must think its customers are a bit slow on the uptake. 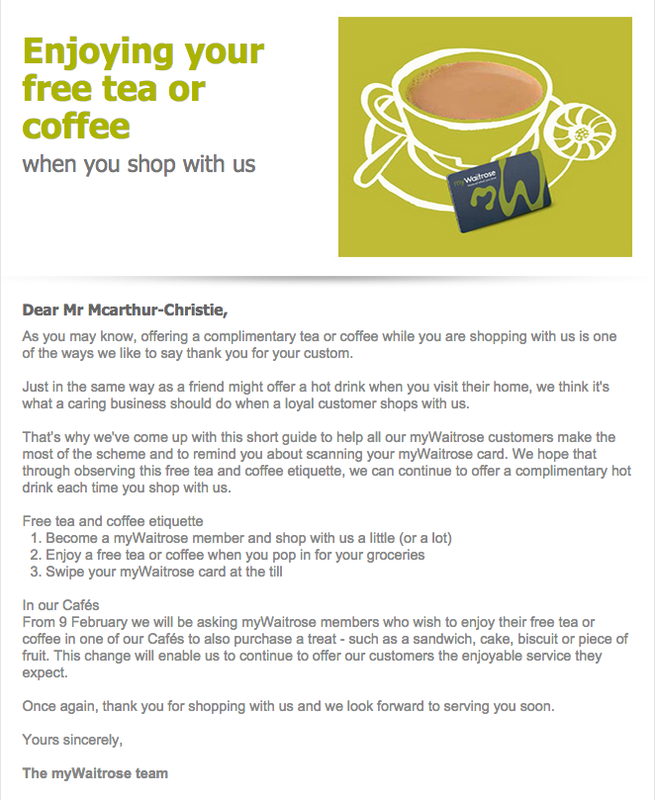 They’ve just sent an email to Waitrose loyalty card holders that seems to reveal a little corporate unease about the free tea and coffee they currently enjoy. This email, headed ‘Enjoying your free tea or coffee’, should carry one of those little red government-sponsored tags that warn about too much sugar in things. It’s so sugar-coated and faux-sweet that hysterically-laughing dentists are jamming the switchboards of every Porsche dealership in the country. OI, peasant! Swipe yer ruddy card! OK, a little over-sweet perhaps, but my fillings only hurt a little bit. And that’s just from the “…like to say thank you…” line. I’d not noticed any other ways you like to say ‘thank you’, Mr Lewis. But we’ll let that pass. There is better to come. Get a bucket handy before you read the next line. Seriously. Told you. I’ll wait while you recover. The case for the prosecution cites adjective overload, the inappropriateness of a domestic analogy to a national retailer and the sheer yuk of ‘loyal’. But this is not the poor whipped Waitrose writer’s fault, I suspect. A paragraph like this is so internally-focused it can only have been written by someone whose seniority outweighed their writing ability by a serious factor. It must have been someone on the board. I’ll hold off contacting Amnesty about the blatant torture of grammar, but “observing this free tea and coffee etiquette”? Really? I’m calling you on this one, Mr Lewis. I know a threat with menaces when I see one. I either give you my customer data or you deny me my free coffee? Right? And you thought that the old ‘hot coffee’ close would keep people in the shop for longer. Fair enough. Interesting attempt to take the sting out of it by the use of the future tense – “…we will be asking…” But it still can’t obscure what’s really going on. No more nipping into the cafe, helping yourself to a Daily Fail and a freebie coffee and taking space that could be used by a proper, paying customer. And since when was ‘a piece of fruit’ a treat, Mr Lewis? Or a sandwich? Come off it, old chap. We’re sorry. It was all a terrible mistake. We didn’t realise that offering freebie tea and coffee would see us haemorrhaging profits like the French aristocracy in 1789. The car parks are cluttered up with trashy old ’62 plate Evoques. There are people in training shoes and tracksuit bottoms calling the Partners “mate”. For pity’s sake, we’re even giving away bean-to-cup to people who can’t pronounce ‘quinoa’ properly. We’ve had to have our Financial Director resuscitated several times this week – and it’s only Wednesday. This has to stop before we sink under a tsunami of free Columbian. It’s simple. Swipe your sodding Waitrose card – or get the butler to do it – before you help yourself to your free cuppa. Or we’ll set the bloody dogs on you. OK? The best writing advice. Ever. 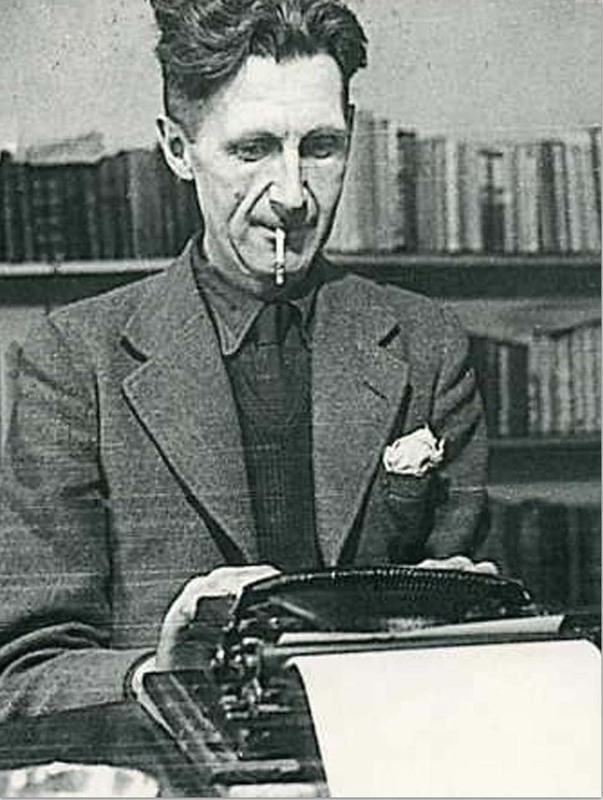 Sixty four years ago today, George Orwell died from tuberculosis in a London hospital. Not only was he – in my opinion – the finest writer in English, in Politics and the English Language he left scribblers some of the finest advice. George Orwell, doing what he did best. Changing people’s minds. – What am I trying to say? – What words will express it? – What image or idiom will make it clearer? – Is this image fresh enough to have an effect? – Could I put it more shortly? – Have I said anything that is avoidably ugly? – Never use a metaphor, simile, or other figure of speech which you are used to seeing in print. I shall be waiting at the bar in the Moon Under Water this evening with two pints poured ready. The curse of sounding professional. 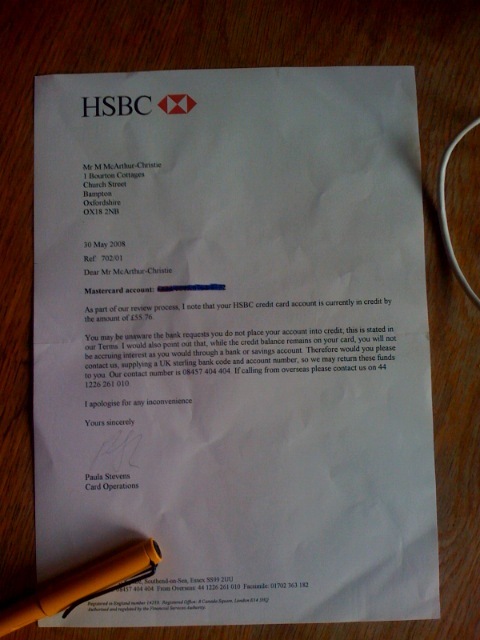 A while ago, I was amazed to get a letter from my bank telling me I was in credit on my credit card. I came across it in an old file today – and it’s just as I remembered. It was from a real person – Paula Stevens from Card Operations. But it didn’t really sound like she’d written it. Instead, it had that slightly remote, finger-wagging, milk-monitorish tone that banks sometimes unintentionally adopt. 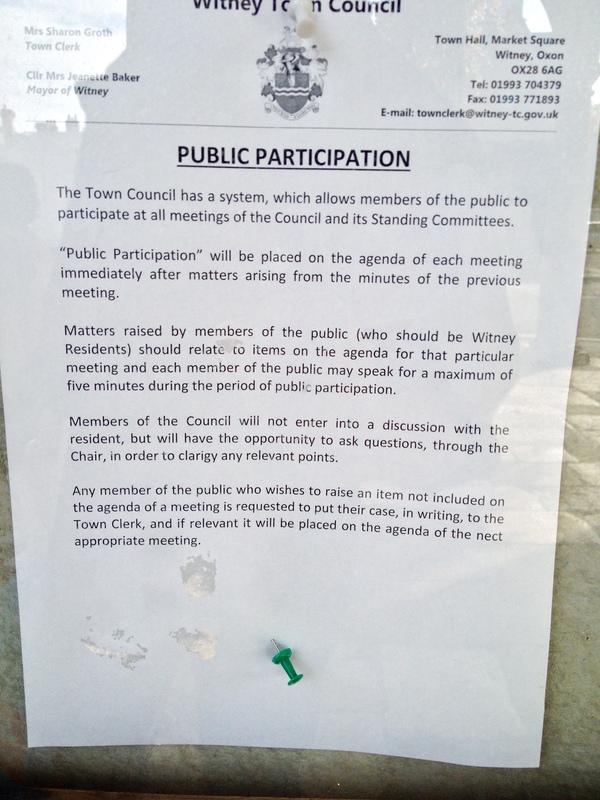 I particularly liked the capitalisation of “Terms” – they must be ever so important if they need a capital letter. I also liked the implication of “You may be unaware…” – it’s always good to call your customers ‘unaware’; goes down well. Simple. Easy. Understandable. And even an attempt to sell the customer something. Hell, why not? I’m sure that Paula Stevens from Card Operations doesn’t speak like this. I’ll bet she’s good fun, enjoys a laugh, uses the word “money” more often than “funds” and would never call a customer “unaware” (although I’ll bet she thinks a lot of us are utter morons – and fair game, we probably are). It’s not Paula’s fault. Somewhere along the line, someone’s told her she needs to sound ‘professional’. In most businesses, that means sounding a bit like a cross between a robot and a traffic policeman. Replacing short, everyday words with long ones. Using too many of them. Nailing them together in sentences that stretch off into the distance with more clauses than Santa’s family. It’s the difference between being literate and actually communicating. The whole ‘sounding professional’ thing is getting in the way of being understood. It’s no good being literate but ending up with stuff that communicates about as well as a page of Linear B. The corporate process doesn’t help either. Paula drafts a letter and it all makes sense. It goes to her manager, who changes a few things, rewrites a paragraph and sends it on to her manager in turn. She does the same thing. Then the letter goes to the Compliance and Risk department. They add in the various bits of required FCA wording – word for word – and change a few more things. How professional is it when the poor old customer has a gnat’s chance of understanding the end result? I know enough customer services teams to know that they’re not like this. They give a big fat damn about their customers and doing right by them. The customer service advisors who’ve come in on Christmas Day – off shift – to fix problems. The ones who’ve got into their own cars after work, driven forms to customers’ houses and helped them complete them – on their own time. Most people go into customer services because they’re interested in helping customers. So – here’s a challenge… There are so many brilliant customer services people behind the bars of that opaque, jargon-ridden, convolutedly structured, difficult language. It’s time they escaped. I’ve started the first tunnel – who’s with me? Dialogue or broadcast? Where’s democracy going? The way we communicate has always changed. We’ve discovered and harnessed new media time and again – all the way from cuneiform to computers. But the newest change is possibly the most powerful and is already starting to change the way we’re governed, sold to and employed. Communication between organisations, governments and businesses and those they serve has nearly always been on a broadcast basis. The politician has spoken, unchallenged apart from perhaps an interviewer, and people have listened. Or not. The business has advertised and people have bought. The only ‘dialogue’ has been at the ballot box or the cash till. It’s all been about broadcast – the sender of the message simply sends and the grateful public receive. And broadcast is fine. There are times when it’s essential. But some of us have been talking for years about how broadcast has insulated those who govern and sell to us about how they really need to communicate. Communication needs to be about dialogue. But one side of that dialogue – the reader’s – has been silent – until recently. That means corporations and governments have been able to speak and write almost as they liked. Today, corporates, organisations and local authorities and governments are still struggling with the democratisation of communication. It’s tragic watching them on Facebook; businesses shouting to an empty room about how great they are. Baffled MPs and councillors ducking under Twitter onslaughts. 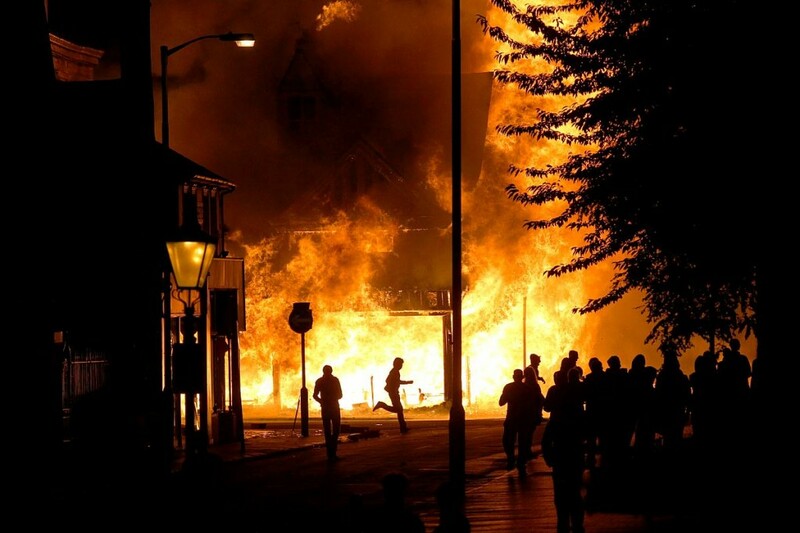 Local authorities wondering why they get social media abuse, not involvement from people in their areas. People are interested – so how do we engage them? It’s not that people aren’t interested. The growth in single-issue and local pressure groups shows that, in fact, people are MORE interested in politics, business, government and society. But they’re turned off by the way these organisations communicate with them. Just listen to almost any politician trying to defend herself on BBC Radio 4’s Any Questions. It’s not dialogue – it’s blocking monologue. It’s not communication, it’s communication’s antithesis. And it is rooted in a past where those in authority knew best. Now, those governed are as likely to know just as much as those governing. And they’re becoming much less shy about telling them so. So, for the first time, communication really IS about dialogue. And the dialogue is showing that people aren’t interested in the big issues that the politicians are – they’re interested in the local issues that affect and hurt them. And they want to get involved. There aren’t easy answers about how government and business can involve these newly-articulate stakeholders, but, imagine the knowledge, information, wisdom, perspective and depth they’d tap into if they could harness social media’s potential for dialogue and did. And, bluntly, to achieve any sort of inclusive, progressive politics and commerce, they need to.